Welcome to the wonderful world of juice, where you can down a heaping dose of produce in one shot. Where you can disguise the taste of your arch nemesis veggies with the mere squeeze of an orange. Juicing is an amazing way to incorporate more fruits and vegetables into your diet. Because our skin is our largest organ and often the first to show signs of poor health, feeding ourselves well is vital to maintaining that glow. Use more vegetables that fruin in your juice. Fruit is beneficial, but also can be high in sugar. Fiber helps slow down the spike in your blood sugar. Since you are removing the fiber when you juice, avoid using too much of high sugar ingredients like pineapple, apples, and grapes. If you’re new to vegetable juice, start with a taste that’s sweet enough for you to enjoy and work towards juices that are mostly veggies. Since many nutrients, such as vitamin A and vitamin E, are fat soluble, it’s a good idea to eat some healthy fats around the same time as your juice. Enjoy a couple slices of avocado, a few almonds, or a teaspoon of coconut oil to help you absorb all the nutrients in your juice. You can still enjoy fresh juice even if you don’t have a juicer. Some people, including the folks behind Minimalist Baker, like to blend ingredients in a blender and then strain out the juice. A nut milk bag would work great for this. We’ve got five recipes today that we love to use to cure our skin woes and keep it glowing. Fennel might be new to your palette. It contains super-antioxidants like superoxide dismutase, that we include in our Citrus Stem Cell Serum, making it perfect for a juice that leaves you looking and feeling vibrant. Cucumbers are well known for their skin benefits because they contain silica. Antioxidants in blackberries protect the skin from environmental stressors, while watercress and broccoli contain sulfur. Some such as David Wolfe consider sulfur-rich foods to be nature’s answer to beauty. You can save the stalks of broccoli that you would normally discard and use them in this juice! The same goes for the kale, if you normally separate the leaves from the stems when you make a kale salad. This juice promotes an even, healthy looking complexion. Eating foods rich in carotenoids, such as carrot and spinach, can actually add warmth to the appearance of your skin. A study performed at Nottingham University looked at participants that, rather than spending time in the sun, ate a diet rich in these vegetables. Those on this diet were rated as looking healthier and more attractive. When your liver is taxed from dealing with unnatural, processed foods, alcohol, toxic skin care, or other factors, it can start faltering in its ability to eliminate toxic chemicals and toxins from the body. Phytonutrients like the betalains in beets are great for your liver. Beets are actually one of the most effective liver cleansing vegetables available, so juicing them regularly is one of the best way to have a healthy liver. Pectin in apples also helps your liver. Lemons are wonderful detoxifiers, and add tang to this juice. Both carrots and broccoli are high in vitamin A, which promotes clean, beautiful skin. This juice is high in potassium and phosphorous, which help reduce stress, which often contributes to and worsens oily skin. Tomatoes add lycopene. Broccoli also provides antioxidants. This juice is sweet, but contains a good dose of vitamins. 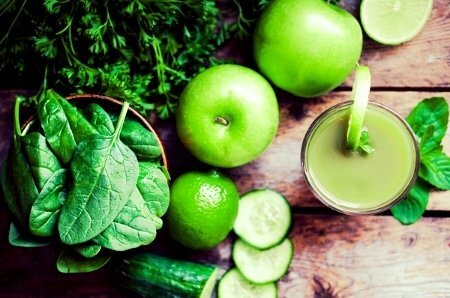 It's perfect for anyone who is just getting started with green juices. Pineapple contains the enzyme bromelain. Juice the core of the pineapple to get the most bromelain. Spinach is highly nutritious, which vitamin C and A, iron, and much more! It has a mild taste, so it works wonderfully in juices. Green leaf lettuce also adds water (hydration is very important for your skin!) as well as vitamin K.
Oranges are a great source of vitamin C. If you are okay with less sweetness, reduce it to half an orange. We hope we've inspired you to get juicing! What are your favorite juice recipes for promoting beautiful skin? Tell us in the comments below! I have a couple of questions. 1. Are beet and beetroot the same thing? 2. Do you think it would be just as beneficial to use a high speed blender such as the nutribullet to make these juices rather than a juicer. I need to invest in either of these applicances and doing a bit of research I like the fact that there is no waste with the nutribullet. Hi Elaine! 1. Yes, beets and beetroots are the same. 🙂 2. I would say if you are between a juicer or a blender, a blender is more versatile. Some people like juice more, and some vegetables do better in a juicer than a blender (beets might be one of those), but overall you can enjoy the same benefits from a smoothie as with a juice. My favorite juice which I make in my Blentec is made with 1 small mango, 1 organic apple, 1 organic kiwi, handful of pineapple shunks, 2 big handful of organic baby spinach leaves or organic kale, 1 tbsp of homemade ground flax seed spread or 1 tbsp of ground flax seeds, 1 tbsp of coconut oil (optional), 1 tbsp hemp seeds , 1 tsp of L-Glutamine powder and 1 1/2 cup of spring water…blend and enjoy! You all mentioned juices are good. But take cucumber, carrots, tomatoes , salad beet cut into pieces add little salt lemon and eat. I boil celery with carrot and tomatoes ,whisk them and drink the juice. In the article you said to avoid sweet fruits such as apples and pineapple. but the recipes call for apples and pineapple and oranges. My favorite juice is banana, apple, nectarine, kale, orange juice and 1 Tblsp. of cold pressed, organic flaxseed oil. I use organic fruits when I can. I used to add frozen blueberries, but the tiny seeds bother my colon. My favorite juice recipe is cucumber, romaine, celery, and lemon. I can’t eat apples right now, but I used to add a granny smith apple for more flavor and tartness. You can adjust the amounts of cucumber, celery etc depending on what flavors you like to be strongest. I like mine to taste like lemonade so I use a lot of lemon! Thanks for the awesome and simple recipe, Sara! I made my kids the cuc, celery, lemon, romaine and an apple juice today and they LOVED it! I have a history of over complicating my juices, lol. Yours is delicious. I juice all kinds of vegetables then put juice in vitamix with unsweetened almond milk and frozen unsweetened strawberries. I add protein and colostrum. This is delicious! Great recipes! Would be better if you used organic fruits & veges, etc.. Otherwise pesticides and other chemicals negate the benefits of the ingredients.